David Alcaide from Spain won the 2009 Italy Open for his first ever Euro Tour title. 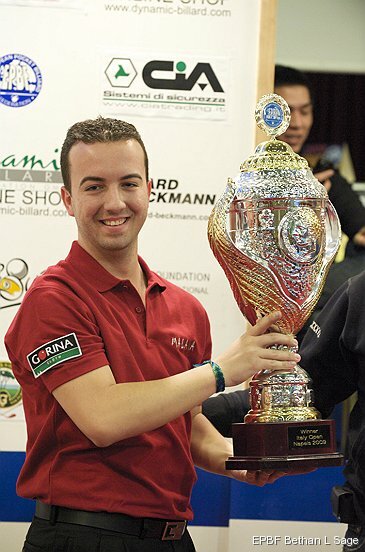 In the final Alcaide defeated Germany's all-time Euro Tour leader Ralf Souquet 9-5. The victory was worth €5000 with Souquet getting €3300 for second place. The semi-finals saw Alcaide trounce England's Craig Osborne 9-2 and Souquet scrape past countryman Marko Vogel 9-4. Alcaide's previous best on the Euro Tour were three semi-final spots. It was Spain's second win with Samir Kaddur winning the 2004 Denmark Open. This was Souquet's 25th final, of which he has won a Tour-leading 15 times. The German legend is on a terrific run. His last six finishes is 5th, 1st, 1st, 5th, 3rd and 2nd. Defending champion Darren Appleton (England) lost 9-6 to Mateusz Sniegocki (Poland) in the last 32. The win took Alcaide from 15th to fourth in the Euro Tour Ranking. Losing finalist Souquet improved from second to first. Former leader Niels Feijen (Netherlands) dropped to second after a disappointing 9th place and Nick van den Berg (Netherlands) stayed in third. The tournament was played 26-28 March at the Holiday Inn, Castel Volturno, Italy. It was the second event of seven on the 2009 Euro Tour. Next up is the German Open which runs from May 21-23 2009. It will be the 99th event on the Euro Tour but the first with 10-ball. I wonder what difference (if any) the move to 10-ball will have? The break will be harder to master so will it suit the better players overall or just those that can break well? I think we are seeing a shift at the moment, more and more tournaments are turning to 10-ball, what are your thoughts Hermund? I definitely think 10-ball will take over the position as the leading game within American pool. The break is harder to master. In 9-ball, with the tighter racks, you can pretty much control what happens without putting a whole lot of effort into it. I think the best power breakers will have a greater advantage in 10-ball. In my opinion runouts are harder, more strategic thinking is required and there are fewer elements of luck.